While new innovation in surveillance is sorely lacking, a startup is championing an amitious idea - surveillance robots - using very non traditional means. In this note, we examine OCULUS's key features, pricing and positioning looking at where this might provide tangible benefits to security users. 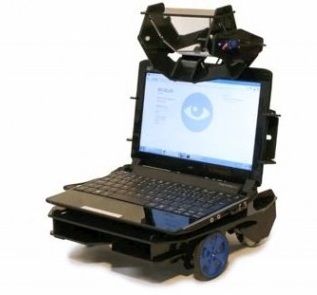 The 'OCULUS: Surveillance and Telepresence Robot' pairs a laptop/netbook device with a Arduino powered, remotely controlled motorized carriage. Using the integrated computer webcamera as eyes, the carriage provides the ability to steer and position the combine devices as a type of surveillance drone. While not intended to be a replacement for a purpose-built security drone, the OCULUS proves a mobile camera beyond PTZ capability for a very low cost. The 'inventor' of OCULUS, Colin Adamson of Xaxxon Technologies, describes how the unit could be useful to autonomously patrol blindspots in existing video surveillance systems. However, limitations of patrolling PTZ cameras also apply to OCULUS. He suggests that OCULUS could indicate a 'more ominious security presence' since the robot includes 2 way audio and can be equipped with headlights. Adamson envisions a fleet of inexpensive, autonomously patrolling robots supplementing small staffs of human security guards. Placing a robot in harm's way is a preffered scenario over risking human life, and OCULUS might provide that option in some circumstances. 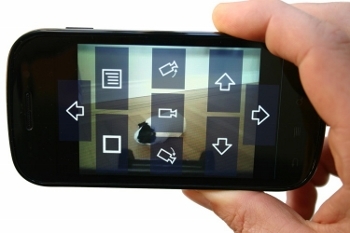 Camera Performance: This key performance attribute is governed by the quality of the integrated webcamera on the paired computer. As such, resolution, framerate, and low-light performance are may be marginal. Speed: Unit quickness is limited by system power budget. The robot moves rather quickly given power and weight constraints, but is rather modest compared to a running human. Power: Unit power is drawn from the laptop/netbook, and service life depends entirely on the size and strength of those batteries. OCULUS' website states that 'typical laptop batteries support 1 - 2 hours of continuious video streaming and driving before requiring a recharge'. Terrain: the unit is not suitable to be driven on anything but flat, even terrain and is not sealed against moisture. This limits the deployment areas of OCULUS to flat indoor spaces like corridors, warehouse areas, and parking garages. Currently, the video stream generated by OCULUS is for live viewing only, and is not recorded to the local machine. Live camera views can be seen by concurrent users. The video has no provision to be externally streamed or recorded by 3rd party video management software. The OCULUS ROV can be purchased directly from Xaxxon for about $270 USD. This price does not include the central laptop/netbook component, and must be furnished seperately. The concept is designed to work with a number of different types of computers, and older laptops may be a good repurposed fit. A charging station is part of the purchase, and can be located adjacent to any common 120VAC outlet. Several options, including a chassis powered headlight assembly, can be added for additional cost. For a pretty low cost - a few hundred dollars plus a laptop - security users can experiment with having a mobile robot patroller. While it is obviously not a guard or fixed camera replacement, users in large, flat spaces might find it useful to try out a few of these to complement their existing forces. It might allow them to see more areas without having to send out a person. Some key aspects of performance may be lacking, but the flexibility and low cost of OCULUS make it an interesting consideration for stretched security budgets.